Crafty Students: Bríd Did Découpage. I covered these notebooks with comic books that I bought in a charity shop for 50c each. They were for my friend Gary who often takes photos for this blog. 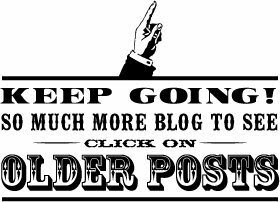 If you would like to give découpaging a try, Natalie previously did a post about it which you can see here. Have a go! 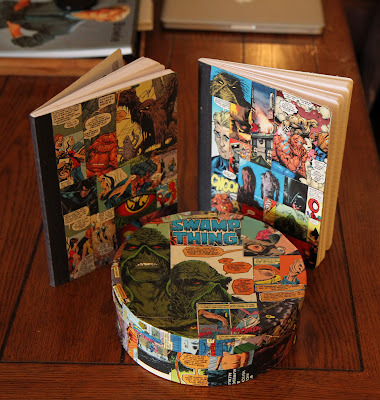 "Swamp Thing" is his favourite comic so I covered a box with pages from an old edition of it. 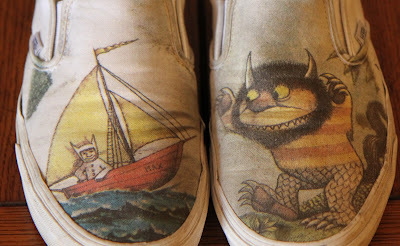 The shoes below I got custom made at a shop in Venice. Gary is a big fan of "Where The Wild Things Are". He even has a tattoo of it. They are super cool. They're just a white pair of Vans with the image screen-printed onto them. Enhanced Vans I say! I hope you all have a lovely week! We are friends from Dublin, Ireland who love knitting, crocheting, dressmaking, card-making, sewing, cooking, baking, crochet, thrift stores and all this craft related. We have all taken the handmade pledge. We always try to make it or fix it ourselves. Someone's rubbish is another person's gold! 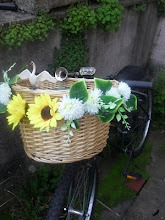 We hope you enjoy our musings and the fruits of our crafty labour! Hoot Hoot. Hoot Hoot. Owl Family.